On Friday, I traveled to Montreal to check out the great lineup of day 1 of Osheaga. Just like last year, I decided to attend only one day of the 3 day festival. Luckily for me, 99% of the acts I wanted to see were playing on Friday. Safe to say, I was absolutely thrilled. My day started off chilling at la Scène des arbres while Ponctuation was playing. The band, comprised of two brothers from Quebec City, put on a good performance. Their style was very White Stripes meets DFA 1979, grunge style. Afterwards I walked back to la Scène de la montagne to see Daughter. To be honest, I only heard their music the day before Osheaga. I had heard of the band previously and I was thinking to myself that I would probably like their music. And I was right. The British indie folk band, fronted by Elena Tonra, sounded absolutely divine. Tonra was charming and very humble. You could tell she was overwhelmed by the love from the crowd; she couldn't stop smiling! I would love to hear them play in a smaller, more intimate setting, where you can really absorb the sound. The crowd was way too loud for music so soft and moody. Up next was Ben Howard. Although I wasn't facing la Scène de la rivière during the set, I did watch from the giant screens. The English singer/songwriter sounded great. He played material from his debut album "Every Kingdom", released in 2011, including this hit single "Only Love". Although the sound was great, it was the same situation as Daughter's performance: the music was too mellow and chill, and the crowd was too loud. It definitely took away from the show. Finally, the moment I was waiting for: Alt-J. I've been anticipating this show for months, and obsessively listening to their album "An Awesome Wave". They started their set with "Interlude" followed by "Tessellate". They played most songs from their album. The band sounded fantastic! The crowd was very enthusiastic, and the energy was absolutely amazing (especially since I was near the stage). The show was as good as I expected and I was extremely happy. 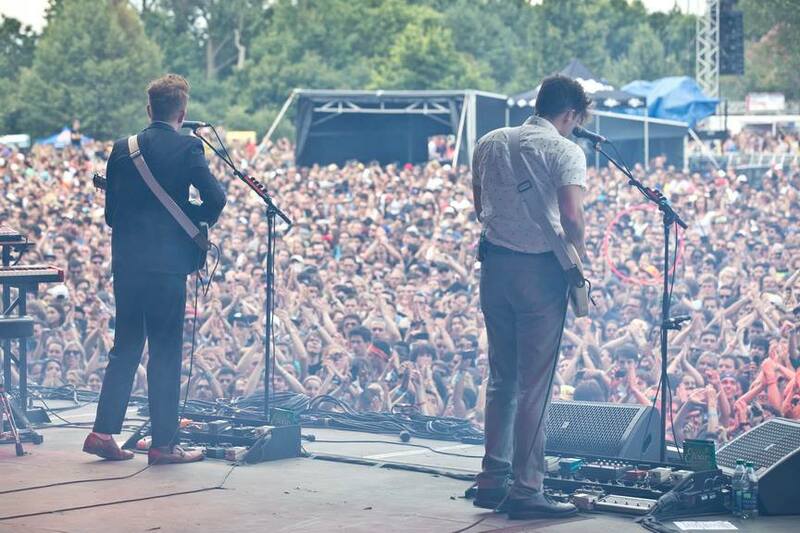 Right after, it was time for Two Door Cinema Club. The crowd was very energetic, and most people were dancing up a storm. A really fun show with a really good setlist. The band played a good mix of songs from both their debut album "Tourist History" and their latest release "Beacon". I was very pleased with their set and I danced my little heart out. Then it was time for the lovely Ellie Goulding to take the stage. She began her set with the song "Don't Say a Word". As soon as her show started, the sound was off. There was a loud crackling that you could hear through the speaker. It was beyond annoying. Near the end of her set, the issue was finally resolved. Goulding played a good mix of tracks from both her albums, including "Animal", "Under the Sheets", "Explosions", "My Blood", "Figure 8" and "I Need Your Love". She also played her latest single "Burn", which will be featured in a re-released "Halcyon" album. Her performance ended with "Anything Could Happen" and "Lights". When she spoke to the crowd, it sounded like Goulding had lost her voice. I believe this may have affected her performance. Overall, it was good, but not great. Afterwards, it was Vampire Weekend's turn. The band started their show with "Diane Young", their first single off their latest album "Modern Vampires in the City". Honestly, it's pretty much the only song that I really wanted to hear. I also ventured to la Scène verte to meet some friends and chill out for a bit. I wasn't bummed about missing most of Vampire Weekend's set seeing as they will be playing at the Ottawa Folkfest. I walked back to la Scène de la montagne right on time to see Phoenix. Their performance really wowed me. I was expecting a good show, but I did not expect that. It sounded like I was listening a CD; it sounded that good! The band started with "Entertainment", the first single off their latest album "Bankrupt!". They played a lot of songs from their hit album "Wolfgang Amadeus Phoenix", including "Lasso", "Armistice", "Lisztomania" and "1901". 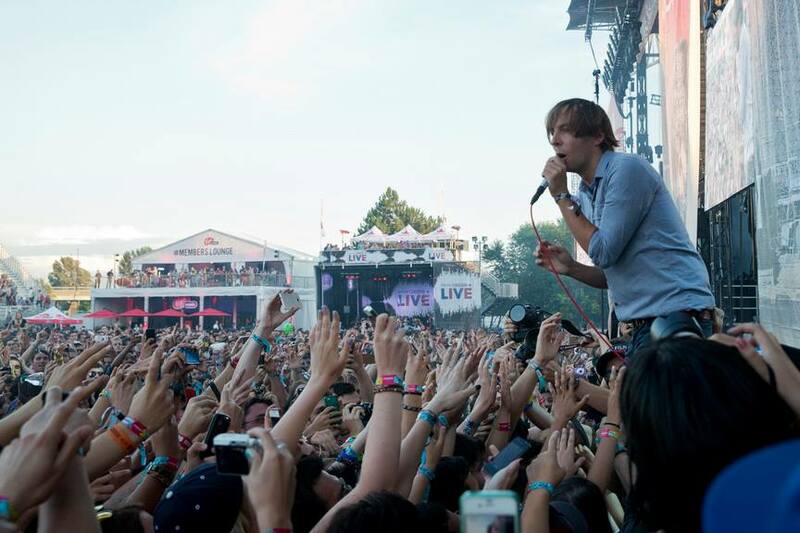 Singer Thomas Mars was absolutely insane! He kept throwing himself in the audience (nearly). Near the end of the set, he actually wandered into the giant crowd with his microphone. The show ended with Mars swimming his way back from the audience to the stage. It was pretty spectacular. Overall, great show, great energy. Very entertaining! By far the biggest surprise of the day for me. My evening ended with a visit to la Scène verte to check out Beach House. I don't know much about the group, except a friend of mine told me that I might really enjoy their music. And I did! The duo plays "dream pop", which makes a lot of sense. The sound is very synth-inspired and is definitely chill, ambiance music (in my opinion). La Scène verte was the perfect venue for this performance. The weather, the night sky, the crowd and the music... It was just perfect. I decided to leave after the performance, because it was seriously the perfect way to end the perfect day. Overall, Friday at this year's Osheaga was absolutely amazing. All the bands put on great performance and I could not have asked for a better day of music.